I love it when a book surprises me, and that is exactly what SEMI-CHARMED LIFE did. I hadn’t heard much about this novel before being contacted by St. Martin’s to review the title. Had they not contacted me, I probably would have missed out on this one, which would have been a shame because I genuinely enjoyed Zelevansky’s debut. 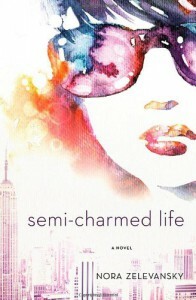 SEMI-CHARMED LIFE is about Beatrice Bernstein, a college senior desperate for change. She ends up finding that change with the help of Veruca Pfeffernoose, a socialite that will change Beatrice's life forever...but not before turning it completely upside down. Beatrice wants to explore, to leave New York and experience what the world has to offer. But her parents insist that there is no reason to leave New York, because they have everything that they could possibly want right there in New York. When Beatrice wishes for freedom, little does she know that very freedom will come in the form of Veruca Pfeffernoose, a popular socialite, and the H.O.S - Veruca's entourage. But not all is as it seems. Beatrice will unearth secrets about the H.O.S that'll make her question what is real and what is fake. What I loved most about SEMI-CHARMED LIFE is that it is ultimately a story about self discovery. Beatrice is so caught up in what she thinks she wants, and the life that she thinks she wants to live, that it isn't until she meets Veruca, that she begins to understand the life that she actually wants. I think a lot of people in their twenties experience something along those lines, at least, I know that I have. Sometimes we think we need something better, that our life as it is just isn't enough, but it's only because we're too blind to see what is sitting in front of us. SEMI-CHARMED LIFE is the perfect beach read. It’s a fun book that readers can easily lose themselves in. There's wit. There's romance. There's drama. It's everything that I was looking for in my next read without even realizing it.